This is a beautifully, stunning venue which can hold both your wedding ceremony and reception or just your reception. 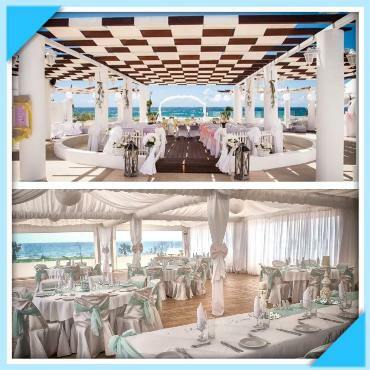 Situated in the heart of Ayia Napa, overlooking the beautiful Mediterranean Sea, this really is a perfect venue. The venue’s ceremony area is surrounded by water and approached via a little bridge, which then, turns into your dance floor at night. The reception is held in our amazing marquee, which can accommodate anywhere from 20-120 people. Both the ceremony and reception areas can be decorated by our fantastic decoration team, Aphrodite Wedding Decor, to suit your colour or theme. Take a look at our Facebook and Instagram pages, to see more photos, of the various decorations we have previously provided for our beautiful brides and grooms. And, as if you need any more reasons to hold the best most special day of your life here, only one wedding per day is held here, so the venue is yours and yours alone, for the full day and evening. With its own private bar and chill out/seating area it has all you could ever wish from a wedding venue (and not a pair of Speedos in sight). Please contact us if you would like any more information on booking this stunning venue, for your special day.